What is banh mi? The term banh mi means "sandwich" and also means "bread". It is a Vietnamese sandwich created by Vietnamese street vendors over a hundred years ago. These sandwiches start with a baguette or homemade banh mi roll (recipe included in book) and are filled with condiments, pickles, and various meats. If you don't have a restaurant in your area that sells banh mi (the sandwich), then you can easily make them at home with the help of Andrea Nguyen's The Banh Mi Handbook. The cookbook begins by helping you to stock your banh mi pantry. Don't be afraid! There is no need to go to a specialty Asian grocery store. The ingredients can be purchased in the Asian food section of your local grocery store. I keep fish sauce, hoisin sauce, oyster sauce, sesame oil, and Sriracha chile sauce in my pantry anyway so the only other ingredient I had to search for was Maggi Seasoning Sauce. I found it at my local Kroger. Once you have your ingredients gathered, you can use this cookbook to go on a culinary journey with recipes for specialty condiments such as cilantro maggi mayonnaise and garlic yogurt sauce and various homemade pickled vegetables. When you're ready to assemble your sandwich, you'll find recipes divided into cold cuts which includes sausages and pate. If you're not a meat eater, you can try edamame pate and baked maggi tofu. I was particularly attracted to the chicken sandwiches such as the one featured on the cookbook's cover, Hanoi grilled chicken. This year, I've started making my own sausage patties. A recipe for chicken sausage patties seasoned with green onions, Thai chile, fish sauce, and oyster sauce sounds absolutely delicious! Another chapter features seafood - shrimp in caramel sauce and herbed salmon cakes. We then move into the pork and beef chapter with Chinese barbecued pork and Korean beef and kimchi. 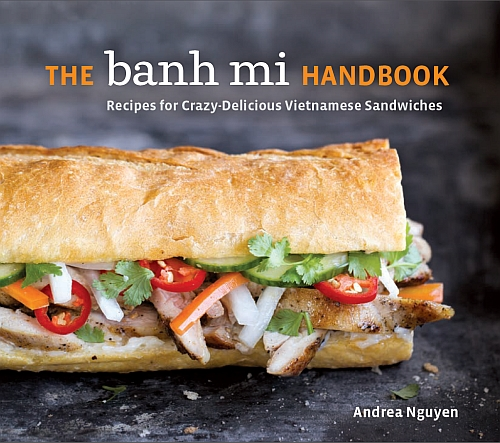 The book closes with chapters featuring vegetarian sandwiches and alternatives to banh mi (the bread) such as lettuce wraps and salads. My son and husband are sandwich lovers. If you can put it between two pieces of bread, they'll eat it! So, this cookbook is the perfect way to experiment with different flavors and unique combinations of ingredients and serve them in a form that is familiar to my family - a sandwich. This is definitely a cookbook that I would recommend to anyone who wants to broaden her cooking horizons. Disclaimer: A review copy of this cookbook was provided to me through Blogging for Books in exchange for my honest opinion.